CHEMICAL weapons have been used by Islamic State (ISIS) militants in Iraq and Syria, according to groups monitoring the increasingly deadly conflict. Poison gas attacks were carried out using ‘chlorine-filled rockets’ on civilians and rebel fighters in Kurdish-controlled areas, the UK-based Syrian Observatory for Human Rights said. Two organisations investigating the attack confirmed chemical weapons had been used in June against the Kurdish group – which has taken a lead in battling Isis fighters. And in a further worrying development, the jihadi group is said to have obtained “industrial grade” gas masks, suggesting they are prepared and equipped for further acts of chemical warfare. 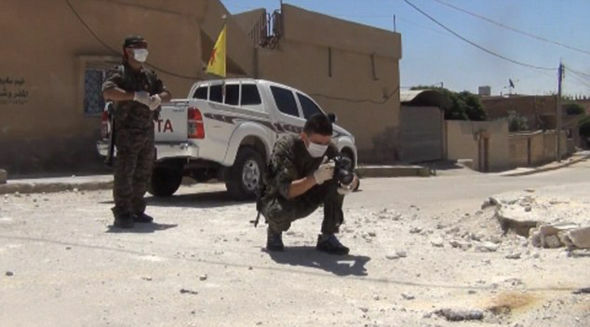 The Syrian Kurdish People’s Protection Units (YPG) militia said the fanatical Islamists had fired “makeshift chemical projectiles” on June 28 at two positions in and near the city of Hasaka. The type of chemical used had not been definitively determined, although initial reports suggested the substance was a chlorine agent. Soldiers exposed to the gas “experienced burning of the throat, eyes and nose, combined with severe headaches, muscle pain and impaired concentration and mobility”, the Kurdish group said. However, none of the YPG fighters died because they were quickly taken to hospital. The White House said it was aware of the reports of chemical weapons use and was seeking additional information. “We continue to monitor these reports closely,” Alistair Baskey, a spokesman for the White House National Security Council, said in a statement. The Nusra Front, al Qaeda’s affiliate in the Syrian war, has previously accused Islamic State of setting a booby trap using barrels of chlorine. Chemical weapons have also been used by the repressive Syrian regime, fronted by president Bashar al-Assad. 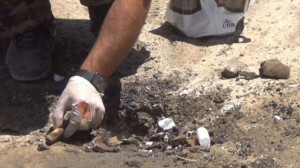 United Nations weapons inspectors confirmed the use of rockets containing the toxic substance sarin in August 2013. The deadliest attack by Syrian government forces took place on a suburb of the Syrian capital, Damascus, killing more than 1,500 people. The attacks hark back to the days of the former Iraqi dictator Saddam Hussein, who used mustard gas and nerve agents against Kurds in the north of the country. In the deadliest chemical attack of his reign, Hussein murdered around 5,000 people in the 1988 Halabja attack, which is recognised by the UK as an act of genocide. It comes as Saudi Arabia announced it has arrested 400 Islamist fighters in one of the most significant round-ups of terrorist suspects of the year-long fight against ISIS. Saudi officials said it had foiled several attacks – although the sweep came too late to stop a suicide bombing in May that killed 22 people – the deadliest militant assault in the kingdom in more than a decade. Saudi Arabia regards Isis as a terrorist organisation and has joined the US in launching airstrikes on fighters in Iraq and Syria. The arrests followed a powerful blast in neighbouring Iraq that killed more than 100 people in one of the country’s deadliest single attacks since US troops pulled out of the country in 2011.